This is the most commonly used design (standard T-Pattern), providing large pressure drop across the valve. When lower pressure drop across the valve is required Y-Pattern is recom-mended. This design is used when two perpen-dicular pipes must be connected. 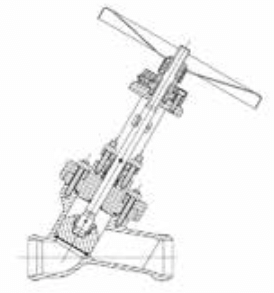 In those cases when valve is intended for control or throttling service, cage guided design is required. There are different types of cages and trims designed to provide different valve characteristics and Cv-values. For API 6A applications choke valves, both positive and adjustable are available. Choke valves are specifically design for service conditions providing different types of beans for positive chokes (including ceramic materials, tungstem carbide and hardened mar-tensitic steels) as well as different configurations of seats, cages and discs for adjustable chokes. 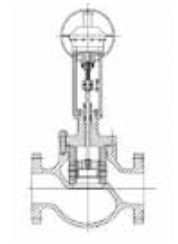 This design is a combination between globe valve and check valve. 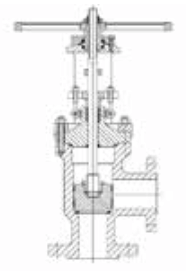 When valve is open, the stem is in open position the valve operates like a piston check valve, disc is moved by the fluid-media. 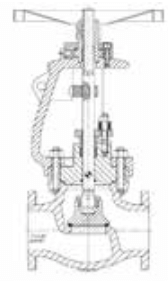 However when valve has to be closed the stem goes down againts the disc ensuring dhut-off of the valve. 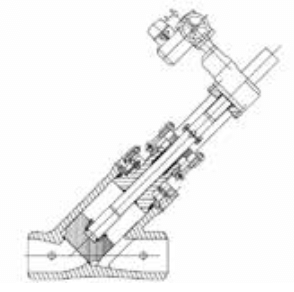 For those applications when emissions to the atmosphere are strictly forbidden, valve is provided with metallic bellows which ensures no leakage through the stem packing to the atmosphere. RV offers a wide range of control valves for the most severe appli-cations.